Gulzar is a man of multiple identities. He is a poet, a short story writer, a scenarist and a dialogue writer. He also writes literature for children. 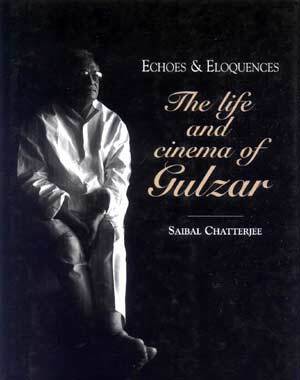 However, in the collective consciousness of the nation, Gulzar is, above all, a filmmaker and lyricist. Gulzar is one of Hindi cinema’s last surviving links with its golden era. What makes him truly special is that he has managed to move with the times without moving away from his poetic moorings. Despite being an integral part of big, bad Bollywood, Gulzar soars above its messy mediocrity. His immense popularity, which hasn’t come at the cost of pandering to the lowest common denominator, rests primarily on the 17 feature films that he has directed and the countless lyrics that he has penned in a career spanning over four eventful decades. ‘Echoes & Eloquences’ is as much a critical appraisal of his cinematic output as it is a biography. It is an attempt to place his films and the fictional worlds they project in the context of his life and times. Gulzar’s films aren’t autobiographical in the least, but each of the cinematic narratives he has crafted with rare skill and diligence since debuting with the trend setting Mere Apne in 1971 reflects a bit of his unique personality and his worldview. A senior editor with the Indian Express, Siabal Chatterjee is a New Delhi-based film and media critic who has worked on the staff of leading Indian publications like The Telegraph, The Times of India, Outlook newsweekly and the website of The Hindustan Times. In a career spanning over two decades, he has covered entertainment-related events and film festivals in different parts of the world and tracked Indian and International cinema with a critic eye. In 2003, he won the President’s Gold Medal for the Best Film Critic. He served as a key member of the editorial board of Encyclopaedia Britannica’s Encyclopaedia of Hindi Cinema.